Could you grow your lunch in an old shipping container? One that’s situated in 40-degree desert heat? A project underway in Abu Dhabi aims to encourage people to do just that – pairing old shipping containers and high-tech hydroponics to overcome the region’s hostile climate and increase local food production. While food security issues are climbing up the agenda globally, they are felt particularly acutely in the United Arab Emirates, where temperatures are high and rain levels low. Creating vertical farms inside shipping containers could help communities grow more of their own produce and cut down on the cost of transporting food to the region. In Masdar City – an urban development project in Abu Dhabi – Madar Farms are using hydroponic systems that require much less water than traditional farms, to grow lettuce, herbs and brassicas. The project is being showcased at Abu Dhabi Sustainability Week. Because the plants are growing in a controlled environment inside the container, with nutrients coming from enriched water, pesticides and insecticides are not required. LED lighting with deep red and blue hues mimics sunlight and cycles on and off to simulate periods of day and night for the plants. LED lighting mimics sunlight and switches off to simulate night. According to proponents of the idea, shipping-container-based farming uses 95% less water than traditional farming. The containers, which are 12.2 metres long and 2.4 wide, are stackable, durable and easy to modify. It’s an idea that’s taking hold elsewhere as well, with CropBox offering a similar idea in the United States. Some people argue that becoming dependent on such methods creates a reliance on a secure energy supply to power the boxes, while others point out it could disrupt ecosystems and harm pollinators. Despite these reservations, vertical farming systems like this one, where grow towers hang vertically, and others, where crops are stacked, are seen as essential for the future of sustainable farming. 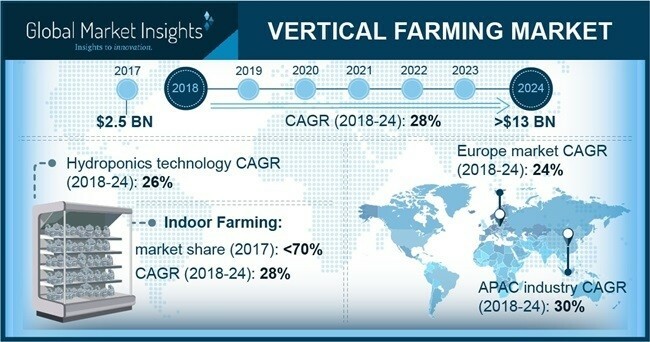 The vertical farming market is forecast by Global Market Insights to grow to $13.9 billion a year in 2024, from $2.5 billion in 2017. Shaping the Future of Food is one of the World Economic Forum’s key initiatives, since it anticipates the global population will have swelled to 9.8 billion by 2050, resulting in a need for 70% more food than is consumed today. Leadership, innovation and collaborative action are needed to meet the challenge, it says.